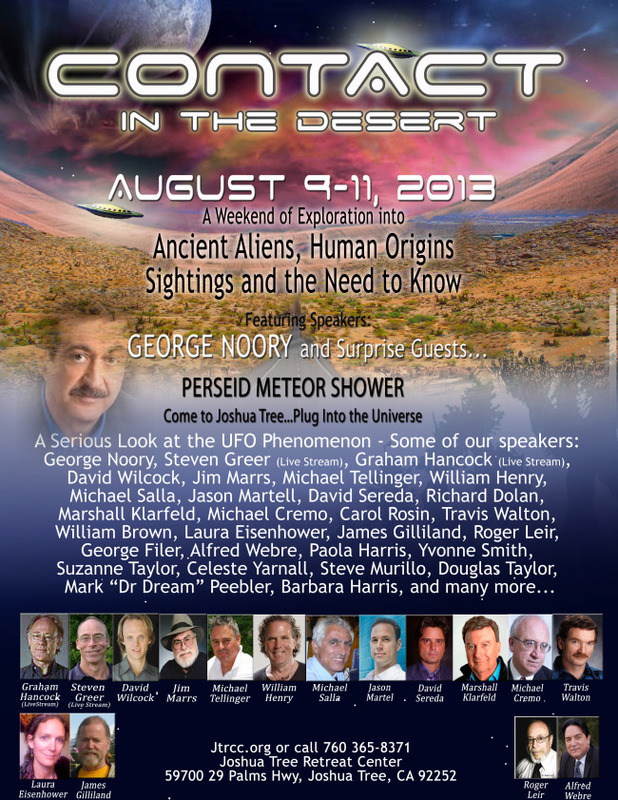 From August 9 to 11, 2013 "Contact in the Desert" was held at Joshua Tree Retreat Center, in Joshua Tree, California. Fortunately it was held indoors, because outdoors the temperature hovered around 110 degrees. 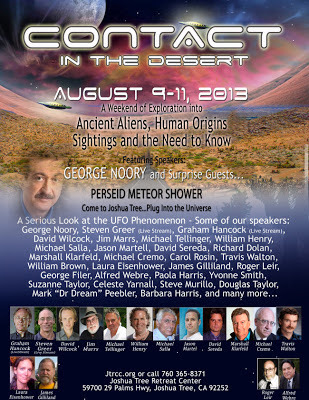 Among the "luminaries" lecturing were George Noory, Steven Greer, Giorgio A. Tsoukalos [aliens! ], David Wilcock, Jim Marrs, William Henry, Michael Salla, Jason Martell, David Sereda, Richard Dolan, and Travis Walton. But not all of the heat was outside. A page on Unknown Country, the website of Whitley and Anne Strieber, has an article dated September 5, titled "William Describes a Bizarre Horror Show at a UFO Conference." It concerns William Henry, a promoter of woo who lectures about ancient Egyptian "stargates" and is a frequent guest on Coast to Coast AM and Ancient Aliens. William Henry tells a horrifying story of imprisonment of the audience at the Contact in the Desert Conference August 9--11. He says that David Wilcock came with a bodyguard, and that Steven Greer arrived with a whole group of bodyguards, who proceeded to lock the doors and allow nobody in our out during his presentation. If this happened, it was illegal, and we urge all UFO conference attendees to demand that they not be imprisoned during any performance for any reason. David Wilcock is a psychic and best-selling author of loopy books on Consciousness. He claims to be the reincarnation of Edgar Cayce. UFO mega-celebrity Steven Greer needs no introduction (if you aren't familiar with Greer, enter his name into the search box at the top of the page). Have you seen the movie "Bruce Almighty?" Do you remember Morgan Freeman playing God where he was dressed in an all white suit? Well Wilcock came out wearing the exact same thing with his "holier than thou" attitude ( which, by the way, including him shoving aside a young woman who was merely asking for his autograph on his own book....I bet she won't buy another one of his books again). Anyhow, I got sick of hearing his bologna during his lecture so I walked out. Now here is where I may be wrong or Streiber is wrong but I believe it was Wilcock speaking when this incident happened: I'm outside talking to a friend at the coffee vendor when I hear some loud arguing with a familiar voice. The normally soft spoken Henry was livid & was walking from the side of the hall to the front with someone trying to restrain him. He banged on the door & a security guard opened the door & he went crazy yelling at the guard for not letting his wife outside to get some air. Apparently she has a condition of some sort & also was extremely hot yet the guards didn't open the door to let her out. The yelling lasted for a few minutes & as Henry walked away with his wife, he was still yelling back at the guard, loud enough to where just about everyone in the vicinity heard. He said everything from it being illegal to lock people in, a big lawsuit can arise if anyone gets hurt, etc...all valid points. One more thing I might add: Greer showed up with armed guards with "black ops security" written on their shirts. Wilcock not only had guards, he had a bomb-sniffing dog with him!! Can you believe that? Anyhow, it was truly a fiasco....every bit of it. So apparently they were only letting people out when other people were being let in! Here is a brief video my friend took showing Greer walking up to the stage at his outdoor event, flanked by his "Black Ops Security" guards. If you watch this carefully, full-screen, you can just make out the words "Black Ops" I seriously doubt that people who work in Black Ops wear shirts that say "Black Ops" on them. That sort of defeats the purpose of a Black Op, doesn't it? We can actually see three of his security men, wearing yellow hats, positioning themselves in from of the exits, and they remain there for the duration of the lecture. I have never seen security guards do this at any other conference! At first we see two security men in front of the exit on the right. At about 1:42 into the video, one of the men crosses quickly and (apparently) takes up a position in from of an exit at the far left. We see him (I think) ever-so-briefly at about 12:58. Greer repeats the allegation that he was offered $2 Billion (not million!) to join the Conspiracy. He had made this allegation in previous lectures. Greer's talk continues past the end of this video at 26:32, so we don't know if any security issues came up (like somebody trying to leave). Anyone else who has first-hand knowledge of this matter, please share it with us. And surely somebody, somewhere, must have taken a photo of Wilcock's bomb-sniffing dog in action? I'd love to see that! At 05:23 on Sept. 2, 2013, YouTube user Lou20764 of UFO Australia was photographing the International Space Station (ISS) pass in the pre-dawn sky over Melbourne. Then about twenty minutes later, at 5:47, he noticed part of the sky light up, and then saw and recorded a huge, glowing object high in the sky. It seemed to be pulsating and changing its shape. He had two separate cameras running, and both recorded the same thing, which makes the possibility of a hoax much less likely. Lou posted the video to YouTube, where in a few days it was viewed over 100,000 times. A thread was started on the conspiracy-oriented website Above Top Secret, which attracted the usual mix of intelligent comment and wild speculation. Noting the similarity of this event to previous rocket fuel dumps, space author and skeptic James Oberg suggested that a Chinese rocket launched just 30 minutes earlier was a likely candidate. Satellite expert Ted Molczan, who confirmed the identity of the "Top Ten" 1996 Mothership UFO sighting in the Yukon, confirmed that it was indeed the Yaogan 17 rocket, whose launch can be seen in the video below. The Chinese rocket was passing over Melbourne exactly where the object was recorded. Molczan writes, "The fuel dump by the CZ-4C upper stage that launched China's third NOSS-like triad was seen over Australia, and a long video was made by Lou20764, from Melbourne. The event occurred on 2013 Sep 01 about 19:49 UTC (Sep 02 05:49 local time)." In other words, this is a reconnaissance satellite for the Chinese military, similar to ones that the U.S. Navy has been using for decades. Oberg and others posted this information to Lou's YouTube page containing the video, but he promptly removed them. Lou wrote, "Not putting up with a organized attack by trolls anymore - I just took out the garbage and I feel good about it." To Lou, anyone who threatened his prized UFO video by providing a rational explanation is simply a "troll." Of course, he left up adulatory comments even if their statements are inaccurate or false. Molczan wrote, "Lou20764 seems to believe he saw some sort of ET craft, and so far has been refractory to other ideas. When Jim Oberg posted a congratulatory note on his having captured the fuel dump and requested some technical details, Lou20764 deleted his messages and blocked him from making further comments. Unfortunate behavior, but it should not prevent us from enjoying the latest fuel dump imagery." 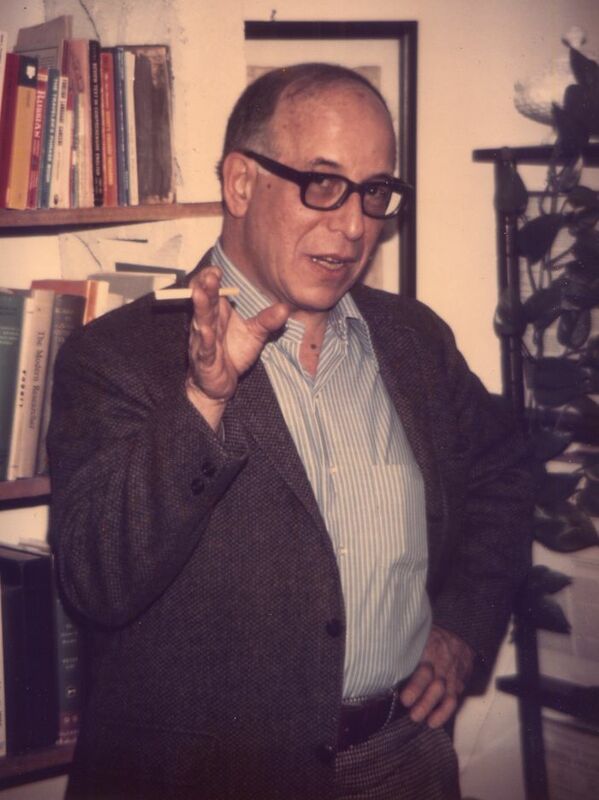 Just Published: never-seen Philip J. Klass papers on MJ-12 and the Condon Report. I have just placed on my Historical documents page on Debunker.com some newly-scanned "white papers" and correspondence by the influential skeptic Philip J. Klass (1919-2005) concerning the supposed MJ-12 papers, and a pre-publication critique of the Condon report. In November, 1968, Klass wrote an advance critique of the not-yet-published Condon Report (University of Colorado study of UFOs), and circulated it to only a very few persons (fortunately, I was one). 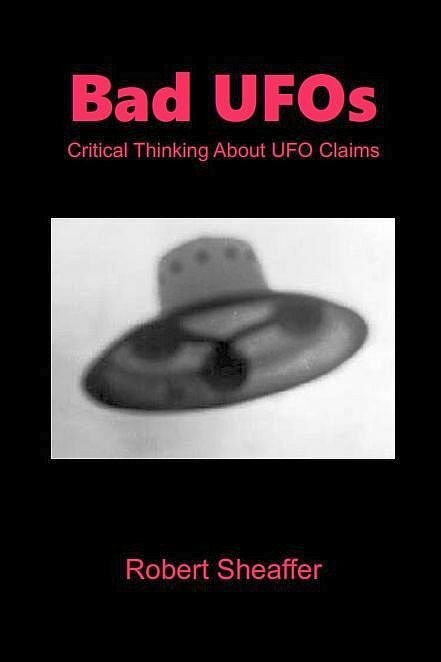 He notes that the persons involved in the study were supposed to be uncommitted on the the question of UFOs, but several were already UFO believers. Here is Klass' explanation of the $1,000 wager that he lost to Stanton Friedman.